of the window above the level of battens. To the inside of the flashing there is glued flexible insulating material which adheres tightly to window frame constituting a thermo-insulated frame. Thermo-insulating material has excellent insulating values (coefficient ג ). Below the level of the batten the window is insulated by a wool insulating kit XDP. The Thermo flashing enhances U value of the window up to 15% depending on the window type, thus avoiding thermal bridging and heat loss. The EHV-AT Thermo is a universal flashing type and can be used with all types of roof coverings up to 90 mm profile depth and with all wooden as well as aluminium-clad plastic roof windows. It is applied as standard to individual windows in the slope of the roof. 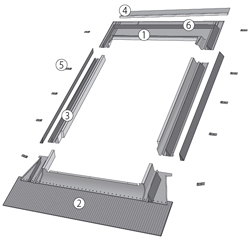 The flashing may also be used as module flashing for windows used in horizontal and vertical combinations or block groups available for installation of windows at a depth V (0 cm), on roofs with pitches between 15° and 90°. The EHV-AT Thermo is a universal flashing type. Can be used with all types of roof coverings. The flashing is 22mm wider than standard and is made of four basic elements (bottom element, two sides elements and top element), each element is equipped with glued insulation material, In the set, there are included correct width side covering profiles. The lower element has a long, wide aluminium plastic apron with an adhesive PVC fillet adhered to the underside. This allows the flashing to be adhered to the roof covering for a perfect fit. The flashing is equipped with side sealing channels to protect against wind blown dust, leaves, rain and snow. In the set there is a weep flap to allow condensation to drain away from the window.